As you may know, a Newborn Care Specialist or NCS is defined as an individual with a unique combination of specialized knowledge and hands on experience in the care of infants and newborns. Last week, we discussed what an NCS does overnight, and one of the things readers wanted to know more about was what types of questions to ask their NCS before their shift starts. Below are a few common topic areas about which we are frequently asked. Have you ever noticed your infant doing something you’ve never seen before? Asking your Newborn Care Specialist about unusual actions is an excellent way to gain peace of mind or spot a potential problem before it becomes a serious issue. Many times, something that may seem unusual to you may be perfectly reasonable for a child to experience or may have a simple explanation. Things like day/night confusion, cluster feeding, and overstimulation are examples of some common behaviors that many parents may not be aware of but that an NCS can easily identify. Babies develop extremely quickly during the first few months and have a variety of reflexes that they are born with or develop over time. Your Newborn Care Specialist is trained to know when significant milestones are typically reached. They are also knowledgeable about the different reflexes that your baby will display, when they develop, how long they last, and even, in some instances, why they exist. Taking the time to ask your NCS about your child’s development can help you know what to expect and when. 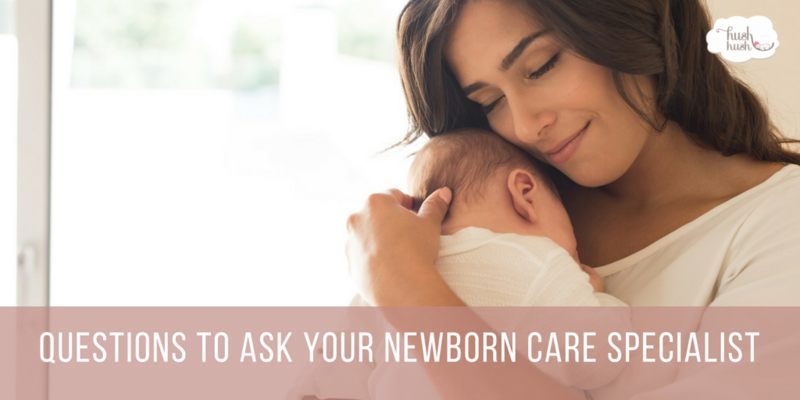 In some cases, the questions you want to ask your Newborn Care Specialist are more detailed or complicated than can be covered before their shift starts. In these cases, your NCS may recommend that you set up a consultation either with them or an expert in the field of your question. Consultations provide parents with the opportunity to have someone work with them one on one to address a particular issue or question they may have and are a wonderful way to get the answers and support you need regarding knowledge and techniques. Hush Hush Little Baby is proud to have many specialists on our team and would love to help you with whatever issues you may be facing. Contact us today to schedule a specialized consultation for you or someone you love.